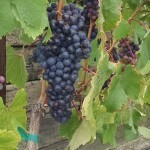 Dolcetto is an Italian variety that De Angelis Wines now makes. We have had this wine in Italy, and have enjoyed it. As winemakers De Angelis Wines has wanted to produce Dolcetto for quite a while. It is a wonderful wine that offers opportunities to have this wine as a stand alone drink or as a food-friendly accompaniment to a fine dish of Italian food. We decided to make this wine when we grafted over our vineyard to 100% Dolcetto three years ago. We are very pleased with how this variety grows on the Central Coast of California – near the Pacific Ocean. Our vineyard is a small hillside vineyard, and the estate fruit is excellent. The yield is about 2 tons/acre on a pro rata basis. Our goal is to increase the yields to about 3 tons. This wine is now getting great attention from professional tasters and wine buyers. this is surprising since this Italian variety is not well known on Central California. Based on the limited release data we now have, the Dolcetto will be released n December of 2016 – in time for the Christmas and New Years holidays. This Dolcetto is very dark, velvety wine that leaves an essence of blackberries, and other similar fruits in the mouth. 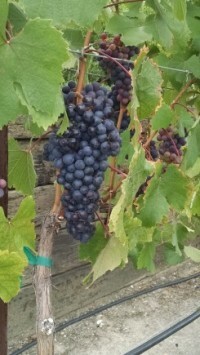 The tannins are supple and not aggressive. The finish long and smooth. The basic response to this wine has been “When can we purchase this wine?” The answer from De Angelis Wines is “very soon”. This wine has already become popular. Because of this reception, we will continue to increase yields each year and to make our limited production more efficiently.